Yesterday I showed the J.W. Marriott Guanacaste Resort from the air, so today I am showing a photo of the resort from the sea. I apologize for the quality of the photo, but I was out on a fishing boat several miles away on a somewhat hazy day, so this was the best I could do using a 12 times zoom. I am showing this to give a perspective on how much green, open space remains in the area, even though major hotel developments such as the Marriott, have come to the area. The Marriott is located as part of the 4,500 acre Hacienda Pinilla property, which is a master-planned area that will leave much of the land in open space and much of the coastline undeveloped. Tomorrow is the monthly Daily Photo Theme Day. For the several days thereafter I will return to a little series about the beach between Langosta and Hacienda Pinilla, and I will show what happens when my family exhibited some lack of foresight and planning and how my wife solved the problem that confronted us. Today is Sunday, so we have new photos posted on our Viva la Voyage travel photo site. This week we are showing sunrise photos of some of the monuments of Washington, D.C. Yesterday I mentioned the J.W. Marriott Guanacaste Resort, which is located as part of the Hacienda Pinilla development across the Langosta Estuary from Tamarindo/Langosta. It has been open for about a year or so. My son took this photo during his gyrocopter ride last year. I think that the major hotel chains that have located along the "Gold Coast" of Costa Rica's northwest Pacific area, of which Tamarindo is the main resort town, are good for the area. They provide jobs, and the upscale development add to the image of the area. I also think that the fact that major international chains such as Marriott and the Four Seasons, have located here give reassurance to foreign visitors that the area is a worthwhile place to visit. I have benefited directly from the Marriott in at least one respect. I have guests staying in our condo soon who are coming to the area for a business conference at the Marriott, but are extending their staying the area by renting my condo. Thank you, Marriott. This week on our Viva la Voyage travel photo site we are showing photos of three locations on the Riviera Maya: the Mayan ruins of Tulum, the eco-park of Xelha, and a resort on the beach in Cancun. This is the mouth of the Langosta Estuary. The beach chairs are property of the Barcelo Resort. People can walk across the estuary mouth during low tide and walk for miles on a very uncrowded beach, as you can see in this photo. The beach on the other side of the estuary is part of the Hacienda Pinilla property, a gated, masterplanned community of 4,500 acres. The J.W. Marriott Guanacaste Resort is a couple of miles down that beach. You can walk along the beach there, but if you drive from Tamarindo it would take about 20 minutes, and you would have to talk your way through the guard at the gate. In Tamarindo and Langosta, there is a road that runs along the beach, but it is only 2 - 3 miles (3 - 5 km) long because there is the Tamarindo estuary on the north side of Tamarindo and the Langosta estuary on the south side of Langosta. There is no road across either estuary because the estuaries are left as mangrove forest wetlands and wildlife habitat. To go from Tamarindo to beaches south or north of town by car, you have to drive inland, then take a road either north or south and then drive back to the coast. It is only about 15 minutes or so, but it is much quicker so simply walk or swim across the mouth of the estuary, as you see in this photo, and reach the same area in about 30 seconds. Here is a green iguana captured in some brown rather than green vegetation so that he is easier to see. I like this photo because of the contrast in color with the background and the full profile view show his features well. The characteristic features of a green iguana include the sickle shaped scales running down his back and the banded tail, both of which are on display here. He looks prehistoric. Iguanas are usually motionless up in trees. They eat leaves, although teenage iguanas prefer insects. I apologize that I have not been able to respond to the comments left on this site during the past two weeks. I was away in Tanzania with very limited internet access. I was able to log on with my Blackberry to check the site, but was unable to acknowledge the comments, which, as always, I appreciate very much. Here is a view of Tamarindo Bay and some of the fishing boats waiting to to out to find some fish. Before Tamarindo was an international resort, and before it was a surfing village, it was a fishing village. I am sure that the few local fishermen who lived in the area did not have modern boats like these. I don't know if it is true or not, but I was told by one elderly gentleman that in addition to being a fishing village, in the old days Tamarindo was a place where rich men from the capitol of San Jose kept their mistresses. I am sure the man believed that to be true, as he told me that in church, and I am sure that he would not be telling me a falsehood in church. I have shown some photos of condos on Langosta Beach, so here is a photo of one of the ocean front houses. It is a little hard to see behind the trees. I assume that these owners want some privacy, judging by the amount of vegetation that they have planted to shield the view of the house from the beach, and judging from the "Private Residence" sign that faces the beach, where I was standing while I took this photo. I don't blame them. If I had a house on the beach, I would not want people staring from the beach up into the back yard. Houses in Tamarindo are much less expensive per square meter (or foot) than condos because it is so much easier (and less costly) to take care of condos than houses for people who are not there all the time. 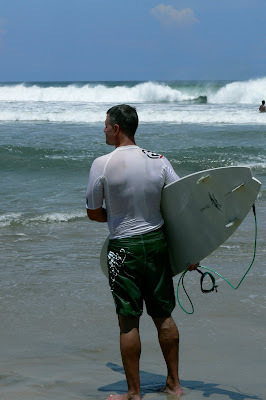 OK, yesterday I promised the female readers of this blog that I would show another photo of surfing form. This surfer has obviously just emerged from the water, as his hair and shirt are still wet. It looks like he is trying to decide whether he should go back out to catch some more waves, go join the beach volleyball game that is in progress in front of the Barcelo Resort on Langosta Beach, or maybe he is checking out some of the other surfers. This is an example of how being a Daily Photo blogger causes one to take more photos of everyday surroundings than one would ordinarily take if it were not for the necessity to post a new photo every day. I guarantee that I would not have taken this photo if it were not for my estimation that there might be some viewers of this blog who would be interested in the seeing the photo. This guy looks to be a good surfer. Good form. He is ahead of the break of the wave on Playa Langosta, just a few steps down the beach from our condo. I figured that because I showed some surfboards not in use yesterday, I should show a surfboard being used properly today. Gals, tomorrow I will show another surfer who you might find has good form. I will express no opinion on the subject. Viva la Voyage travel photo site. This week, we are showing photos of three locations on the Riviera Maya, the Mayan ruins of Tulum, the eco-park of Xelha, and a resort on the beach in Cancun. For all of those who struggle in traffic and have frustration trying to find a place to park your car in big cities, here is a Tamarindo traffic jam. The most stressful part of your day may be deciding where to place your surfboard on the beach? Why would there be a crowd of surfboards at this spot on the beach, you might wonder? There was a volley ball game on the beach nearby, so people who came to surf were playing volley ball instead. We have photos of Santa Fe, New Mexico posted on our Viva la Voyage travel photo site. Tomorrow is Sunday, so we will be posting some new photos for you to enjoy. This photo shows a boy driving his cattle through a church yard in a Costa Rican village. While the church was under construction, the church yard was apparently a short cut between the house and stables of this boy's family in town and the pasture where the cattle graze during the day. I took this photo several years ago, so the church may be finished today. If you have not done so already this week, please take a look at the photos of Santa Fe, New Mexico, which we are sharing on our Viva la Voyage travel photo site. This is a typical elementary school in a Costa Rican village. This is in Guaitil, a village of pottery artisans, located about a half hour inland from Tamarindo. As I have mentioned before, Costa Rica abolished its military in 1949 and allocated the military budget instead on education and health care. The result is that today Costa Rica's literacy rate and measures of public health are equivalent to the USA. There is an emphasis in Costa Rica on teaching children English because so many jobs are in the tourist sector of the economy and, in the Central Valley around San Jose, the high technology manufacturing sector. English is helpful for workers in both industries. While we are on the subject of learning a language, I would like to take this occasion to comment about all of the Daily Photo bloggers around the world who post their photos and exchange comments in English when it is not their first language. They have my admiration and appreciation. This week we are sharing some photos of Santa Fe, New Mexico on our Viva la Voyage travel photo site. Santa Cruz is the nearest large town to Tamarindo. It is about 20 minutes away. Typical of Tico towns, the town square has a shade structure that is similar in function to a gazebo that you might expect to see in other town squares. Santa Cruz is know as a center for folklore and festivals, so this shade structure comes in handy. Unlike Tamarindo, which is a beach resort that caters to foreign visitors and residents, Santa Cruz is a town of Costa Ricans. It is the second most important city of the Guanacaste province, with 15,000 residents. Tamarindo is not incorporated as its own town, and Santa Cruz is actually where the town government is located that governs Tamarindo. There are buses that bring people from Santa Cruz to Tamarindo to work in jobs in the the hotels and restaurants. There are disadvantages to having a town government that is 20 minutes inland. Some people think that Tamrindo contributes much more in taxes to Santa Cruz than the amount that is spent in Tamarindo. It should not be surprising that the politicians would pay more attention to the Costa Rican people who elect them, than to foreign residents in Tamarindo who do not vote. There have been improvements to Tamarindo from the public pressure on the government in Santa Cruz. Lifeguards for the beach and the addition of a police station are examples. The road to Tamarindo was repaved about two years ago, and the documents have recently been signed to pave the last little stretch of unpaved road from from Tamarindo to Langosta, and to pave the loop road that runs all around Langosta. Of course you would expect to see a Catholic church in the center of any Costa Rican town, and Santa Cruz is no exception. The tower peeks through the trees in the park across the street from the the church. Santa Cruz is know for being a commercial center for the cattle ranches of Guanacaste. It has rodeos and other festivals celebrating the ranching tradition. The second week of January is the time of the main fiesta and rodeo. Lots of the workers in the hotels, restaurants and Sadly, three blocks of the center of town burned down in a fire in 1993. I mentioned yesterday that there is an issue that the town government of Santa Cruz also governs Tamarindo and much more money is raised in taxes from the tourist industry in Tamarindo than amount that the Santa Cruz government spends for improvements in Tamarindo. I think that is OK to a reasonable extent. After all, nearly every area with a tourist industry tries to make some money to lessen the taxes on the local population. Towns in Italy charge fees for tour busses to drive into the towns and drop of their tourists who spend money in the shops and restaurants. When you rent a car at the airport in Phoenix, Arizona, you are paying for the construction of the wonderful football stadium, as local voters would approve a tax on airport rental cars because locals don't rent cars at the airport, of course. This week we are showing photos of Santa Fe, New Mexico on our Viva la Voyage travel photo site. Come take a look. I have posted a fair number of iguanas and crocodiles lately, so I should show some birds. Here are two in the same photo. A great egret is in the foreground, but I cannot make out the species that is in the background. Costa Rica has more species of birds than all of the USA and Canada combined, so it is not surprising that it is possible to get two different species of the heron family in the same photo. An article in the local newspaper just reported that biologists have recently discovered 5 additional bird species in Costa Rica not previously cataloged as present here. This week we are showing photos of Santa Fe, New Mexico on our Viva la Voyage travel photo site. We think you will enjoy them. Happy Valentine's Day with this view of the end of a Tamarindo sunset. I don't know what it is about sunsets that conjures romantic moods and imagery, but I thought it would be fitting to use this sunset series as a build up to Valentine's Day. I have a confession to make. I am not a particularly romantic type of guy because, after all, men don't have to be in touch with our feelings. During our wedding ceremony, I read a poem that I composed, and during part of it I got down on one knee and asked my wife to change her political party registration. She said no, but gave a proper affirmative response later in the wedding. Today is Sunday, so that means there are new photos on our Viva la Voyage travel photo site. This week we are sharing photos of Santa Fe, New Mexico. The sun has about disappeared. The bottle of wine is about done. Our nightly ritual of watching the sunset from our balcony is calm, quiet and relaxing. Have you been to to the nightly sunset watching festivities at Mallory Square in Key West? It is the opposite of our mellow sunset observances. In Key West people gather, with street performers, music, dancing, and all kinds of fun. On our travel photo site, Viva la Voyage, we are showing aerial photos this week of an active volcano on the Big Island of Hawaii. Tomorrow is Sunday, so we will have new photos from somewhere else in the world. The sun is descending into the sea. I am sorry that I cannot share with you on this blog the sound of the waves, the cooling effect of the ocean breeze, the smell of the salt air, or a taste of the wine. If you live in a cold climate, I hope that this helps warm you with thoughts of summer. On our travel photo site, Viva la Voyage, we are showing aerial photos this week of an active volcano on the Big Island of Hawaii. The sun is about to make contact with the water. It is about time for a second glass of wine. I don't know what it is about the sunset that brings a calming end to the day. Costa Rica is only one hour ahead of the time back at our home in the Phoenix/Scottsdale, Arizona area. By the time of the sunset, we can hopefully relax even if we have been on the phone to the office and working on our computers during the day to conduct business as usual back in the USA even when we are in Costa Rica. Here is a closer view of the sun while it is about to descend in to the ocean. We prefer some clouds over the ocean rather than a clear day, as the marine layer of clouds in the distance adds a marbling effect to soften the intensity of the sun. The colors I am showing throughout this series of sunset shots are 100% natural. I have not photoshopped or otherwise edited the photos in any way. What you see is exactly how the photos were captured by the camera and is the color that wee see many evenings. 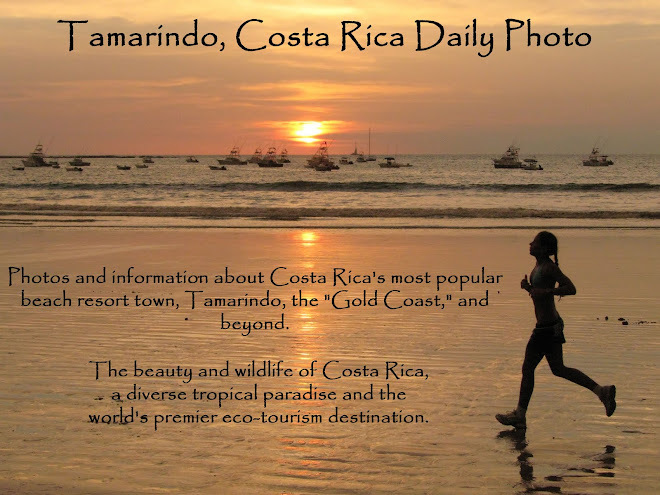 It is no wonder that the Tamarindo area of Costa Rica is referred to as the "Gold Coast." We have a nightly ritual of watching the sunset from the balcony/patio of our Playa Langosta condo in Tamarindo. By mid afternoon, we start to assess what type of sunset we think in might be. When the sunset color starts to develop, that is usually the time to open a bottle of wine and bring out some cheese and crackers. At the risk of being a little repetitive, I plan to walk you through the stages of the same sunset during the next few days. When it is late afternoon, it is time to start anticipating the sunset. Hmmmm, what type of sunset will it be? Are there any clouds out to sea? Will the clouds enhance or obscure the sunset? Here you see some of the chairs on the balcony/patio of our Langosta beach condo. I am sorry that you are not visiting Costa Rica so that we can meet and talk in person, and you could pull up a chair and enjoy the sunset with us. I will try to do the next best thing on this Daily Photo blog. From the comfort of your chair and computer, please join us for a sunset, which I will share with you in a series during this week. This is a view of Tamarindo Bay from the southern side of Tamarindo beach, looking north. The southern end of the beach is protected from the full waves of the ocean by an island and reef, which is why the waves are small here and there are boats moored in the bay. Tamarindo was a fishing village, but there is no dock or pier. There are fishing boats and excursion boats that take tourists out for snorkeling and other trips. To reach the boats, they will bring rafts up on the beach and shuttle the tourists out to the boats through the waves. This is a late afternoon shot, as you may be able to tell by the sun hitting the boats and waves. After the late afternoon, you know what comes next, of course. I will begin a series tomorrow to share that with you. About two weeks ago I showed an overview of Tamarindo from the top of a hill overlooking the town, with a new large condo dominating the skyline rising above the trees in the middle of town. I followed that with a photo of the back side of the condo with some surf shops in the foreground. This is a photo of the front side of the Pacific Park condos up close. This is the building that advertises that it has brought "New York Style" to a Costa Rican beach. Well, I am pleased to report that the road in front of this condo is scheduled to be paved very soon. The local government in Santa Cruz has signed all of the contracts necessary to pave the road in Tamarindo that leads to Playa Langosta, and this condo is located at the beginning of that road. After all, if this building is emulating New York Style, at least it should be located on a road that is paved. The last time I was in New York, the streets were paved. I apologize for the telephone lines in the foreground of this photo, but, unlike New York, Tamarindo does not have underground wiring. I took this photo a few months ago, and there was still some construction activity going on. Although large buildings are somewhat controversial in Tamarindo, this building does make the community more upscale. These are elegantly designed and furnished condos located at a major intersection in town. This project replaced a group of old shacks that provided hostel accommodations for surfers at a few dollars per night. On our Viva la Voyage travel photo site this week we are showing the Dalmatian Coast of Croatia. If you have not been there, please check out the our website this week. You are in for a treat. If you look closely, you will see that there are bats on this tree trunk. They have chosen a tree that camouflages themselves very well. This looks like a tree with bark that has scales. What looks like scales on the underside of the tree are bats hanging upside down. Their little faces are looking right at you. 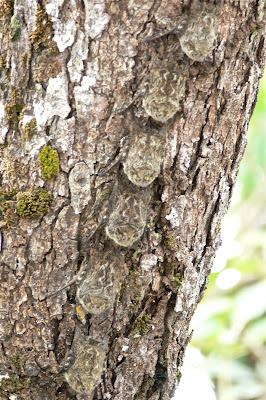 It is not common to see bats on trees in Ccosta Rica. But, of course, I have no idea how many times I have not noticed them but they are there. Here is another take on the "wood theme" for the Daily Photo bloggers. Those of you who have been to Argentina must be thinking, "Hey, what is this guy in Costa Rica doing showing a mate gourd on his website?" The answer is that this is a photo from the Tango y Grill Restaurant, which features Argentine food and ambiance. I would not be familiar with mate if it were not for my older son who lives in Buenos Aires. Mate is similar to tea. People put the leaves in a gourd container, as you see here, then pour in hot water and let it seep. The metal straw that you see is closed on the other end with little holes in it so that the liquid passes through the straw but the mate leaves do not. In Buenos Aires, it is common to see people going to work with a thermos of hot water and their mate leaves, gourd and straw. They even make little leather backpack for carrying mate and thermoses. Although many of the shopkeepers and restaurateurs in Tamarindo are European, there are also Argentines in Tamarindo, including the owner of a computer service store and the gentleman who handles many of the arrangements for the property management company that manages our two condominiums. I sometimes wonder how it is that people who grow up in one country end up living and working in a distant place. My own son has done that, as he is quite at home in Buenos Aires with several businesses there, after growing up in Arizona. When he visits Costa Rica, the people there think he is Argentine because he speaks Spanish with a Buenos Aires accent. Carrying the theme of wood to a new extent, here is a bamboo motif tee shirt that I bought at the Bamboo Groove shop in Tamarindo. Instead of a plastic bag, the shirt was wrapped in a little bamboo basket, as shown in the photo. The Dutch woman who owns the shop told me that she used to sell shirts made from bamboo fibers, but they held moisture more than cotton. A long time ago I posted some photos of the Bamboo Groove shopkeeper's dog, a beautiful yellow Labrador retriever, who has sadly has passed away from his illness. The shopkeeper's husband is a well known architect, Irwin Shuster, who uses bamboo as a building material to design and build houses in Costa Rica using metal panels from used shipping sea containers, bamboo beams to support a peaked roof, and glass. Here is my runner-up selection for yesterday's Daily Photo theme day of "wood." I mentioned yesterday that artisans in Costa Rica make bowls and other decorative objects from the tropical hardwoods. Here is an example. These items make excellent gifts. We bring back bowls, wood trivets, wood holders for desk items and other objects from Costa Rica for the people who work in our office in the USA. The worldwide Daily Photo Theme for Feb. 1 is "wood." Costa Rica has lots of tropical hardwoods. Here is an example. I took this photo on a hike on a trail in Rincon de la Vieja National Park, which is about 90 minutes from Tamarindo. It is a transitional area with higher elevations and more moisture extending up the slope of a volcano. That changes the vegetation to taller and denser forests than is typical of the hills and plains along the Pacific coast. Costa Rica planted 7 million new trees last year as part of its efforts to become the world's first carbon neutral country, which it is scheduled to do in 2021. Costa Rica has excellent artisans who make beautiful bowls and other objects from the tropical hardwoods. I will show an example tomorrow, as I will continue this little wood theme for a few days.